Business trips involve tight schedules. If your flight is delayed or even cancelled, you can easily end up missing your next appointment and the carefully planned schedule falls apart. This is an inconvenience to say the least. But there is good news: business travellers are entitled to compensation, depending on certain conditions being met. The individual who suffers the inconvenience of the flight disruption is the one who is entitled to compensation, not the employer or the person who purchased the ticket. When am I entitled to a compensation? If your flight lands 3 or more hours later than scheduled, and the circumstances meet the criteria of the Regulation No. 261/2004, you’ll be entitled to compensation. 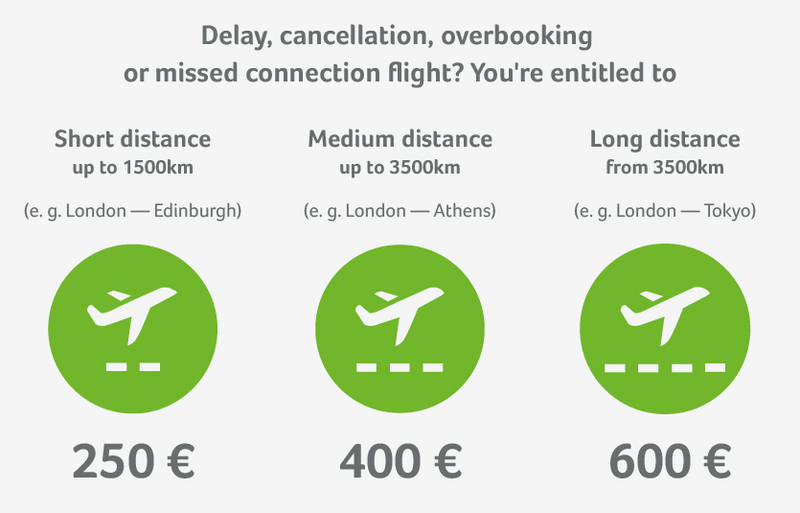 The amount you can claim is between €250 and €600 and the total depends on the distance of your flight - the ticket price is irrelevant. The first thing to do is establish whether or not you have a valid claim. This can often be a confusing and time consuming process: you’ll need to access flight databases, compare your situation with other similar cases, and check whether your case applies under the European Passenger Rights Regulation No. 261/2004 etc. The easy alternative is to apply for your compensation with Flightright. Simply enter your flight details into our free compensation calculator, confirm that you’re entitled to a claim against the airline and then leave it with us. More than 3.2 million happy customers have already made use of our services. If the claim check calculator indicates that you are entitled to a compensation, you can have us enforcing your rights immediately. By selecting us, you are opting for the support of a partner that has been successfully at asserting the rights of air passengers for over 7 years. We have experience with the airlines and are accustomed to their attempts to avoid paying passenger compensations. This enables us to represent our customers’ on a level playing field. We’ll make sure that you get the compensation you’re entitled to, even if it means going to court, where we currently have a 98% enforcement success rate. On a regular basis, airlines attempt to avoid paying customers the compensation that they are owed. A common tactic is to ignore their customers completely. Alternatively, they offer passengers cheap vouchers that are worth far less than what the passengers are actually entitled to, and then ask them to sign a document in which they end up waiving all their rights against the airline. The airline takes the risk that disrupted passengers do not really understand their rights, or will get fed up with repeated attempts to enforce them. This is something that we at Flightright refuse to accept. We help passengers assert their rights and enable them to finally have their voices heard against the airlines. Was your flight cancelled before your scheduled departure? Did this provide an additional delay in your arrival time? Then take a look at our flight cancellations guide. You can find out not only when you are entitled to compensation but also whether you should book another flight at your own expense and when you can opt not to fly at all. We have put together clear information detailing your rights if your flight was overbooked or changed against your will.